← Seasonal Allergies Making you Sneeze INSIDE your Home? Why You Should Clean Your Upholstery! It can be easy to forget the upholstery. You get in a hurry vacuuming the carpet, and there sits the loose dirt on the furniture. Someone sits down and rubs that loose dirt into the upholstered fibers or the dog jumps up and also leaves his dander on the furniture. Like carpet, it’s important to vacuum your upholstery and it’s important to have it professionally cleaned. Furniture and fabric manufacturers recommend that consumers clean their furniture before great soiling has occurred. When a lot of soil accumulates on the furniture, the likelihood of restoring the fabric’s original color, appearance and texture becomes less. By professionally cleaning your furniture you will have a healthier environment in your home, your furniture will last longer, and you will maintain the look of your furniture. A professional has the correct equipment and solutions needed for delicate upholstery fibers. It can be very easy to ruin a piece of furniture if cleaned by the home owner. Upholstery fabric can be delicate, colors can run, and shrinkage can occur. 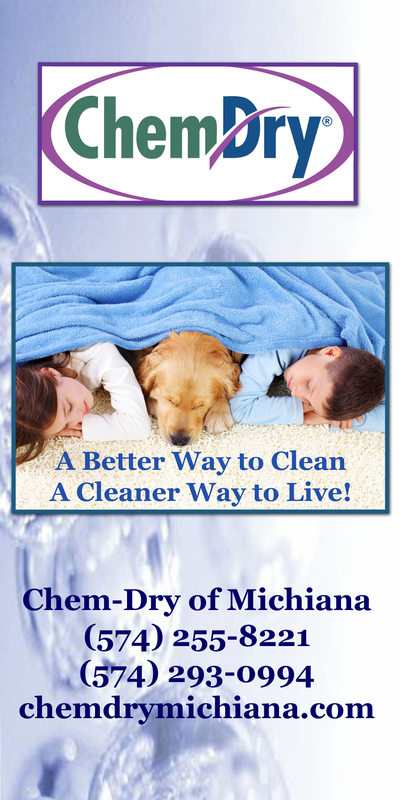 Chem-Dry of Michiana has a team of trained, upholstery cleaning experts. Call us for details on cleaning your furniture so you can have the peace of mind of knowing your home is Drier. Cleaner. Healthier. This entry was posted in Chem-Dry Services, Furniture Cleaning and tagged upholstery cleaners, upholstery cleaning, vacuum furniture. Bookmark the permalink.